A Middle Eastern food consisting of roasted eggplant, olive oil, garlic, lemon juice, and tahini all blended together to be served as a savory spread. Also referred to as Baba Ghanouj, this food dip is traditionally served with pieces of fresh or toasted pita bread cut into three-sided wedges. Most recipes for this eggplant dip are low in fat, cholesterol free and considered to be healthy alternatives for many other dips higher in fat. 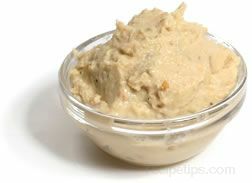 In addition to pita bread, baba ghanoush can also be served with chips or fresh vegetables.